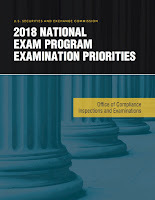 Each year, the Office of Compliance Inspections and Examinations (“OCIE”) of the U.S. Securities and Exchange Commission (“SEC”) communicates its examination priorities for the upcoming year. The SEC has narrowed their focus on the following common themes:(1) Retail Investors (2) Compliance and risks in critical market infrastructure (3) Cybersecurity. Based on these themes, the SEC has pinpointed several key areas of concern that will be focus areas for 2018. Some of which are similar to years past, however, continue to be a priority for the SEC. We have provided an overview below of the key topics that RIAs need to be mindful of in 2018. The SEC will focus on the calculation of fees and expenses paid to the Advisor as well as any compensation that is paid to affiliates of the Advisor. Consistency of the advisory fee calculations and the advisory fee methodology disclosures. If charging an asset-based fee, the consistency of the valuation of client securities and the valuation methodology disclosures. Advisors that receive financial incentives to recommend mutual fund share classes (ie. high sales loads or distribution fees). Client accounts that are not re-assigned to a new IAR when an employee leaves the firm. Advisors that transition from commission based accounts to fee based accounts. As in prior years, the SEC will continue to focus on advisors that offer investment advice through automated programs (ie. robo-advisors). Oversight of the algorithms used to generate general investment advice. Policies and procedures related to client data protection. For advisors that charge a wrap fee (ie. fee that includes both advisory fees and execution costs), they will need to demonstrate that the wrap fee is in the best interest of the client. Any conflicts of interest are disclosed. Disclosure of execution costs with broker-dealers. Due to the large volume of newly registered advisors and the limited resources of the SEC, the SEC will continue to prioritize advisors that have “elevated risk profiles”. This likely includes advisors that fall under the scenarios outlined by the 2018 exam priorities. Advisors that provide investment advisory services to seniors and/or retirement accounts will continue to be a focus for the SEC. Advisors will need to have internal controls in place to identify and mitigate financial exploitation of seniors. Sales of variable insurance products. Usage of target date funds. Advisors that serve state and local government employees and non-profit employees (ie. 403(b) and 457 plans). As the primary investment products for retail clients, the SEC will focus on the types of mutual funds and ETFs recommended to clients. Funds that experienced poor performance or liquidity. Funds that are managed by advisors with little experience managing a fund. Funds that hold securities that are difficult to value due to market stress (ie. securitized loans or mortgage backed securities). Ensure that risk disclosures are provided to investors. Cryptocurrency has wildly risen in popularity over the past year. The SEC will monitor this space as advisors engaged in this market continues to grow. If advisors maintain controls and safeguards to protect assets from theft. If advisors are providing adequate disclosures associated with the risks of these type of investments including: investment losses, trading liquidity, price volatility, and potential fraud. Cybersecurity continues to be a priority for the SEC as we have witnessed large scale cyber attacks over the past year. Please remember that OCIE and the SEC communicate these as PRIORITIES, and not an all-inclusive list of all focus areas. 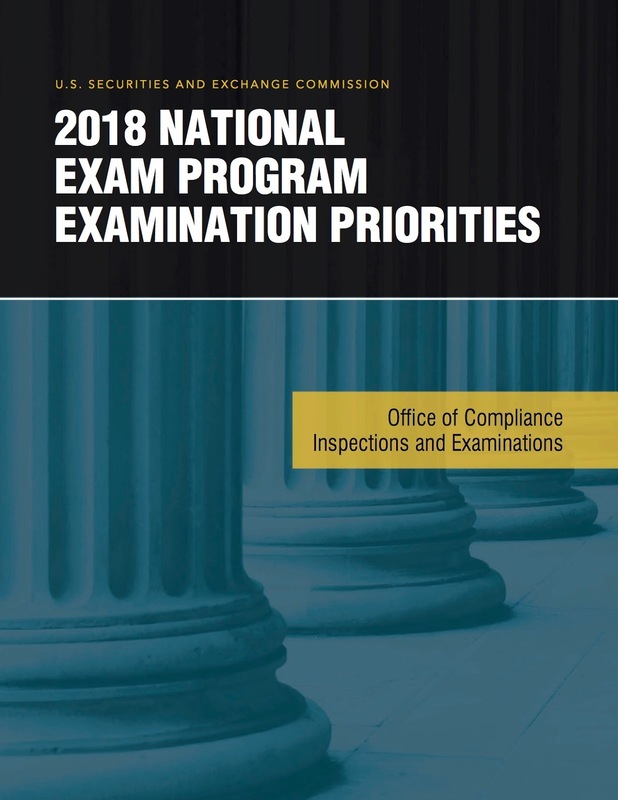 To read the full report, click here: "2018 National Exam Program Examination Priorities"